Understanding phrasal verbs is essential to mastering spoken English. 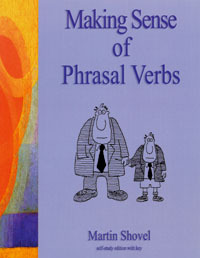 For self-study or for in-class use, Making Sense of Phrasal Verbs covers this in a humorous and lively way. Carefully worded cue questions lead students to an understanding of meaning, and guided and then freer exercises allow them practice in the forms. A reference section with meaning checks, context sentences and collocations is also included.